That is the most frequent question asked by people with old coins or coins they consider unusual for any number of other reasons. Some of the people asking this question don’t collect coins, but perhaps inherited coins or found them in a drawer, a piggy bank or in the course of everyday business. When I answer this question, I explain that just because a coin is old doesn’t mean that it’s extremely valuable. There are Roman coins dating back 2,000 years that might be interesting conversation pieces, but have little value as collectibles. On the other hand, there are coins that were produced by the United States Mint within the last few years that already command relatively high prices. The value of a coin is determined by three basic factors. Those three crucial factors are condition, supply and demand. For buyers and sellers of United States coins, the most important factor is the condition, or grade, of a coin. Collectors and investors place great emphasis on a coin’s grade—or how well preserved it is. Coins that have not generally passed from hand to hand and still look as lustrous and new as they did when they were made, with all of their original detail, are said to be “Uncirculated” or “Mint State.” These are the coins collectors prize the most and, therefore, have the highest values. Coins that have passed through many hands and show extensive wear and tear are not as desirable to collectors, unless these coins are extremely scarce or rare. Coins are “graded,” or rated, on a scale of 1 to 70, with “1” being the grade assigned when the coin is so well worn that it is barely identifiable as to its type. “70” is the grade assigned to a perfect or flawless coin. Coins that are Mint State but less than perfect are graded in a range from 60 to 69. Although these coins are not worn and generally show no evidence of passing from hand to hand, they might have so many scratches on them that they can look as if they were tap danced on. Some might have even been manufactured with incomplete detail and a dull appearance. If these imperfections are very obvious, a coin might receive a grade as low as Mint State-60. If the imperfections are barely perceptible, the coin might receive a grade as high as Mint State-69. WORTH: $2500. 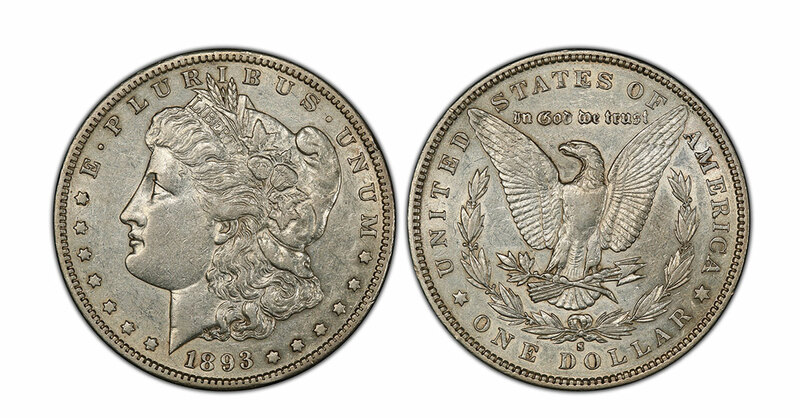 1893 U.S. silver dollar, manufactured at the San Francisco Mint, gets a rating of “6” on the 1 through 70 grading scale. The coin is well worn. A well-worn U.S. silver dollar from 1893 manufactured at the San Francisco Mint has a value of $2,500 when graded “6” on that 1 through 70 rating scale. WORTH: $12,000. 1893 U.S. silver dollar, manufactured at the San Francisco Mint, gets a rating of “45” on a 1 through 70 grading scale. The coin displays more detail than its counterpart rated “6,”, but is still worn. 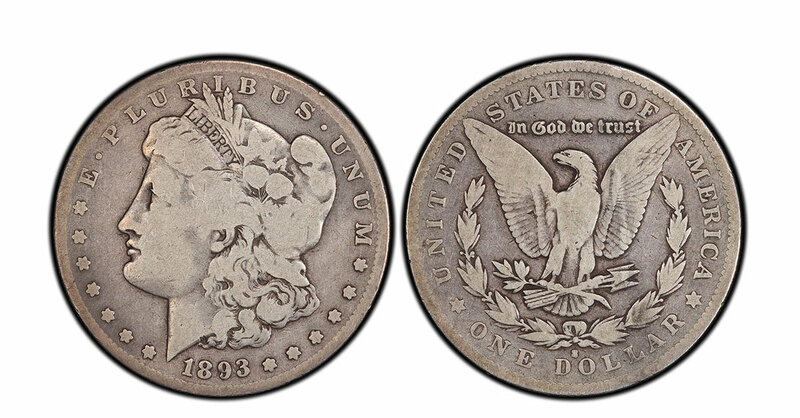 But its less-worn counterpart, also an 1893 silver dollar from the San Francisco Mint, rated “45,” sports a $12,000 price tag. You can have your coins graded professionally by companies whose experts first confirm the authenticity of each coin they review (confirm that it isn’t fake)…assign a grade based on such factors as the way a coin reflects light, eye appeal and the number of flaws, if any…then encapsulate the coin in a sonically sealed, tamper-resistant hard plastic holder, which protects the coin and also displays an insert stating the grade on that 1 through 70 scale. Using one of these companies, such as the Professional Coin Grading Service or the Numismatic Guaranty Corporation, will give you an independent opinion of the grade of your potentially valuable coin without your having to completely rely on a local merchant. 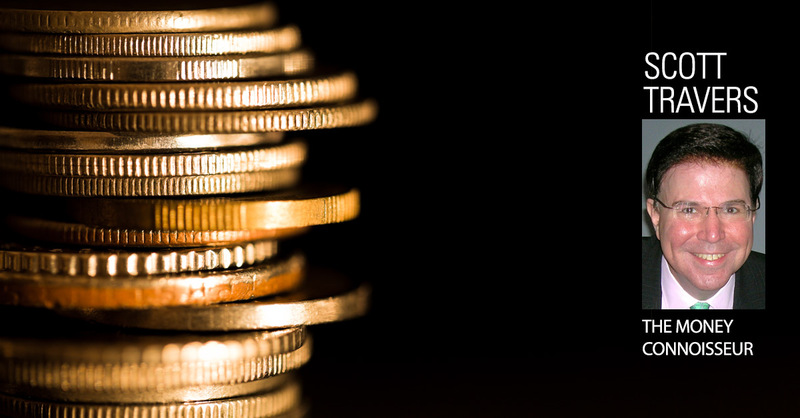 The second and third basic factors in determining the value of a coin are the number of such coins available and the number of people who want them. In other words, the supply and the demand are major factors in determining what a coin is worth. If there are 10 ancient coins of a certain kind and only nine people want one, their value won’t be very high. On the other hand, if the United States Mint manufactured 300,000 examples of a certain coin and a half-million collectors want one, the value of these coins will be reasonably high. In the coin market, as in most other areas of the U.S. economy, price is directly affected by the law of supply and demand. In the case of collectible coins, condition is key as well, and the value of a coin depends on the interrelationship of these three elements. Aside from grade, supply and demand, an element that factors into the value of a coin is the amount of precious metal, such as gold or silver, that it contains. Some coins might be well worn and not in high demand, but could contain half an ounce of gold. So if gold is worth $1,300 per ounce, that well-worn coin shunned by collectors could be worth $650, an amount that is referred to as its “melt value.” I will explore melt values in depth in a future blog. One word of caution concerning the grade of a coin: Do not abrasively clean a coin, even if it appears dark and unsightly. And non-abrasive cleaning should be left to the experts. Collectors often like coins that have turned beautiful colors, or “toned,” over the years. Abrasive cleaning can remove this color along with micron layers of metal from the surface of a coin and, thus, remove detail. If you abrasively clean a coin that’s Mint State, even one that appears dark and unattractive, you can easily reduce it to a circulated state by adding friction or “wear” to the coin. In virtually all cases, cleaning of all kinds should be left to the experts. Scott A. Travers, the coin market's Number One insider, gives you the secret tools necessary to navigate the world of coins, banknotes, and precious metals, such as gold and silver. Whether you have coins in a safety deposit box, a vintage dollar bill under the mattress or a hidden stash of gold bars, Money Connoisseur will teach you tricks of the trade. Scott A. Travers, president of Scott Travers Rare Coin Galleries, LLC, ranks as one of the most knowledgeable and influential coin dealers and advisers in the world. Scott is the author of seven best-selling books on coins, including The Insider’s Guide to U.S. Coin Values and The Coin Collector's Survival Manual. He is a former vice president of the American Numismatic Association, served as a coin-valuation consultant to the Federal Trade Commission and is a forceful consumer advocate for the coin-buying public. Scott is one of Bottom Line’s Featured Experts—follow his blog, The Money Connoisseur, and watch his videos, Face Value: Investing in Metals and Money.